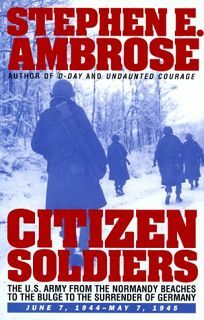 The story of the front-line American combatants who took WWII to the Germans from Normandy to the Elbe River makes, in Ambrose's expert hands, for an outstanding sequel to his D-Day (1994). These men are frequently dismissed as winning victories by firepower rather than acknowledged for their individual fighting power. Using interviews and other personal accounts by both German and American participants, Ambrose tells instead the story of enlisted men and junior officers who not only mastered the battlefield but developed emotional resources that endured and transcended the shocks of modern combat. Ambrose's accounts of the fighting in Normandy, the breakout and the bitter autumn struggles for Aachen and the battles in the Huertgen Forest and around Metz depict an army depending not on generalship but on the courage, skill and adaptability of small-unit commanders and their men. The 1945 offensive into Germany was a triumph of a citizen army, but the price was high. One infantry company landed in Normandy on August 8 with 187 men and six officers. By V-E Day, 625 men had served in its ranks. Fifty-one had been killed, 183 wounded and 167 suffered frostbite or trench foot. Nor do statistics tell the whole story. Ambrose's reconstruction of ""a night on the line"" is a brilliant evocation of physical hardship and emotional isolation that left no foxhole veteran unscarred. It is good to be reminded of brave men's brave deeds with the eloquence and insight that the author brings to this splendid, generously illustrated and moving history. Photos. 250,000 first printing; BOMC and History Book Club main selections, QPB alternate; Reader's Digest Condensed Book. (Nov.) FYI: In an outpouring of Ambrosia, the author has two other books scheduled for fall publication. They are reviewed below.